“With profound regret and sorrow the Holy Synod the Russian Orthodox Church learned about the statement made by the Holy Synod of the Orthodox Church of Constantinople concerning the appointment of its two ‘exarchs’ to Kiev,” the Moscow Patriarchate said in a statement. Bartholomew I, known as Archbishop of Constantinople, New Rome and Ecumenical Patriarch, is regarded as the “first among equals” of the world’s Orthodox Christians. MOSCOW: The Russian Orthodox Church on Friday (Sep 14) cut “diplomatic ties” with Bartholomew I, the Istanbul-based spiritual leader of the world’s Orthodox Christians, accusing him of encroaching on its religious territory in Ukraine. “The Ecumenical Patriarchate of Constantinople has intruded on the canonical territory of the Moscow Patriarchate by sending its exarchs to Kiev,” Metropolitan Hilarion, head of the Russian Church’s foreign relations department, said at Moscow’s Danilov Monastery. If the Istanbul-based rival continues its “anti-canonical activities” the bonds will be severed completely, the statement added. “The full responsibility for the tragic consequences of this schism will rest with Patriarch Batholomew I and bishops who support him,” the statement said. Russian Orthodox Patriarch Kirill, who is seen as a strong ally of President Vladimir Putin, wants to prevent pro-Western Ukraine from getting an independent church. I reported about this brewing rift a couple of weeks ago (see Alexander Zakharchenko buried and Patriarch Bartholomew may have upset Patriarch Kirill on Ukraine). It appears to have gotten much more serious. Though perhaps the current cut and threat are mainly being used as negotiating tactics. It should be mentioned that most of the Eastern Orthodox are actually Russian Orthodox. Yet, the Patriarch of Constantinople has long been considered the “first among equals” in the Eastern Orthodox world. 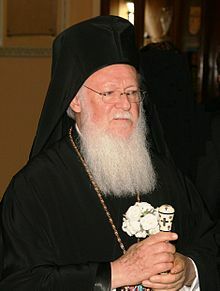 The current Patriarch Bartholomew has accepted an ecumenical agenda that many of the Greek Orthodox do not like (for details, see Why Should American Catholics Fear Unity with the Orthodox? (And the Protestants))–but it is less clear what most of the Russians think. Russia’s President Vladimir Putin has long maintained a close working relationship with the Russian Orthodox Church. There will continue to be tensions because of the situation with Ukraine. Constantinople, while wanting to support Ukraine, is likely loath to lose most of the members of the Eastern Orthodox. The Russian people basically support Vladimir Putin and Patriarch Kirill on Ukraine, so they would tend to be willing to accept ties being cut with Constantinople over it taking jurisdiction over Ukraine. Both the Patriarch of Russia and the Patriarch of Constantinople believe they can point to historical reasons why Ukraine should be under their patriarchy (see https://www.dw.com/en/politics-powers-and-struggle-over-ukraines-orthodox-church/a-45325235). So, both sides basically can claim history supports their view. Yet, Patriarch Bartholomew does not want to alienate Patriarch Kirill unnecessarily for many reasons, including the fact that Patriarch Bartholomew wants ecumenical unity and really wants Patriarch Kirill’s concurrence on that. Perhaps I should mention that both Patriarchs Bartholomew and Kirill have a decent relationship with the ecumenical Pope Francis. So, we will see how this works out. No matter what happens with the Ukrainian Orthodox, I believe that, in the future based on biblical prophecies (e.g. Revelation 13), and for a time, the Russian Orthodox will go along with some of Constantinople’s ecumenical plans. But I also believe, based on prophecies such as in Jeremiah 50, that the Russians and the Russian Orthodox will one day turn against the Beast power that will arise in Europe. The announcement by the Russian Orthodox, in my view, is establishing a precedent for the future when Russia and various of its allies will turn against the rising Babylonian Beast in Europe. Bible prophecy shows that Russia will lead a massive empire in the time of the end (Jeremiah 50:9,11,41-43; Isaiah 13:1, 17-19). Russia is also developing more powerful weapons (see Will Russia’s ‘Satan 2’ destroy Texas or France?). Vladimir Putin has been considered the “defender of the faith” (see also Vladimir Putin is seen as defender of the Russian Orthodox faith) and he has made statements that suggest he believes that he is. Perhaps it should be mentioned that the Bible shows that the USA and its closest allies will fall, but not by Russia (cf. Daniel 11:39; see also USA in Prophecy: The Strongest Fortresses). Russia has a prophesied place as a military power–ultimately it will help defeat the Beast power in Europe that will arise and one day takeover the world (Jeremiah 50:9,11,41-43; Isaiah 13:1, 17-19; cf. Daniel 11:44). For a time, Russia will likely have a treaty with Europe (cf. Revelation 13:3-4.8 and Ezekiel 27:13-14)–but this will not last (cf. Daniel 11:44). Ultimately, the Bible shows that a Russian-influenced coalition will destroy much of Europe (Jeremiah 50 & 51). However, that will not happen until towards the end of the ‘Day of the Lord.’ An event well over seven years in the future from now (see When Will the Great Tribulation Begin? The ‘Day of the Lord’?). The current rift between Kirill and Bartholomew will not mean that Constantinople and Russia will not cooperate ecumenically in the future–they will, no matter what happens in the near term. But that cooperation will not last. The announcement that the Russian Orthodox are willing to completely cut ties with Constantinople is proof that it will be willing to do so in the future. And that is something I have long expected. This entry was posted on Saturday, September 15th, 2018 at 3:30 pm	and is filed under Religious News.